While no one really knows why, the old and young alike have always been fascinated by tiny objects and people. 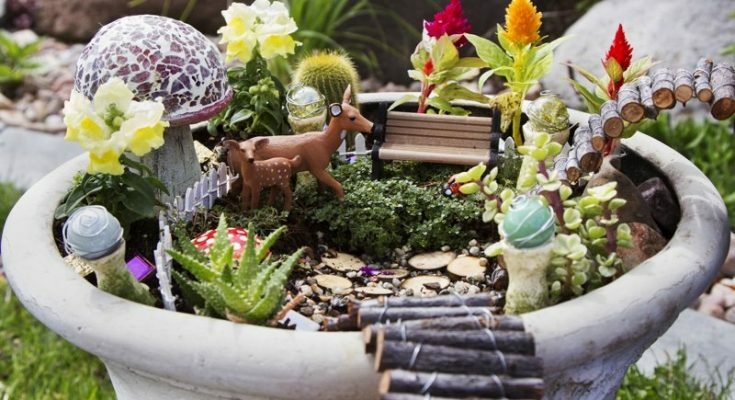 That could be why one of the newest design trends for outdoor living spaces is the use of miniature fairy gardens. These magical creations have eye-catching features that quickly draw the attention of passersby who can’t resist the urge to inspect all of the minute details that they offer. For those who have never added fairy features to their garden before, the task might seem a bit daunting because it isn’t easy to figure out how to mix them in with any existing garden beds, trees, and shrubs. So the following is a list of a few helpful hints on how to make the process of building your first home fairy garden a little easier. Gardening can easily be called a form of artwork because in order to make it look just right, all of the colors, sizes, and shapes of the plants and landscaping features have to be taken into consideration. And, on top of this, just like for a painting or sculpture, there has to be a main focal point to get started with. For this type of garden, one of the best focal points to use is a tree that has a wide base and long, arching roots sprouting up from the ground. Old oak and maple trees that have an opening at the bottom of them are the most preferable since they allow a small door to be placed there. Be sure to put the door on tiny hinges though, so it can be cracked open a little bit to add intrigue. If you don’t happen to have any large trees in your yard, a pot or wooden barrel turned upside down will work just as well. 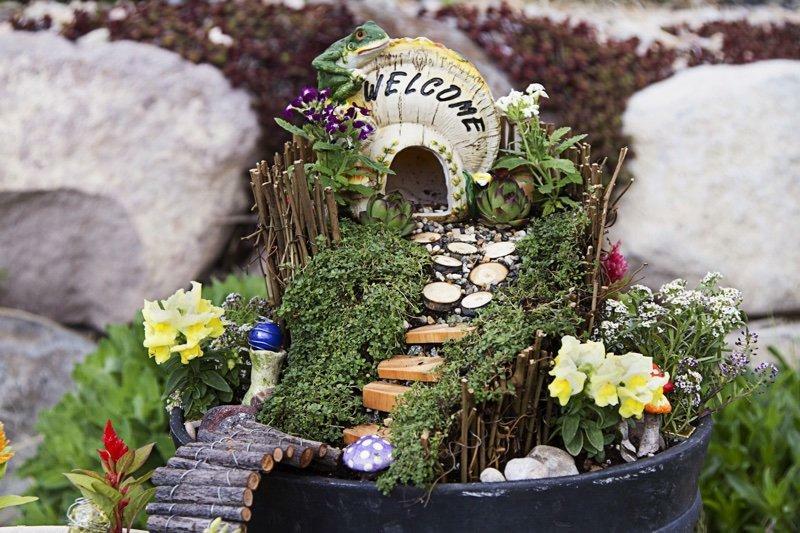 The next step for creating your home fairy garden is to think about what story that the you want to tell with the tiny objects. For example, a person who loves to cook might want to set up a tiny kitchen full of fairies that look busy making the perfect plates of food. Or a business owner might want to build a miniature representation of the day that they first opened up their shop. If visualizing the garden seems difficult, you might want to try doing a simple sketch with a pencil and paper first. 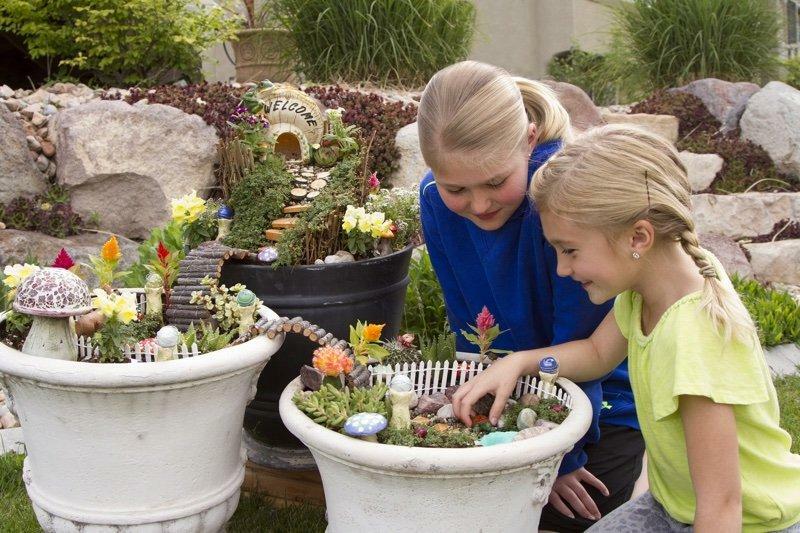 Once you know where you want your fairy garden to be and what you want it to look like, it is time to begin locating all of the supplies that you will need to build it with. Luckily, since fairy gardens are so popular right now, many department stores are currently selling different variations of the decor. They can also be found in garden centers and hobby shops. Those who want to try their hand at clay or ceramic work might want to make their own though. Just be sure to seal the handmade objects with a special glaze after they are baked and painted so that they are waterproof. Now, it is time for the fun part, which is setting your fairy garden decor up. If you haven’t installed the door to the tree or other focal point yet, do this first. That way, you will be able to position your other objects around it accordingly. Attaching some windows on either side of the door is a nice touch too. Or place a small sign above it that depicts what is going on in the scene. Once this task is finished, add any plants, moss, ponds, or stone sidewalks that require digging. And finally, position all of the furniture and fairy creatures around it all. Remember to press each of them firmly into the soil a bit to make sure that they won’t be carried away with the wind or other bad weather.